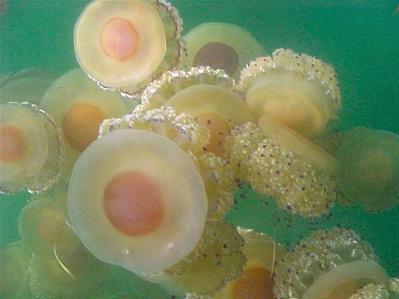 Cotylorhiza tuberculata is a species of jellyfish, also known as the Mediterranean jelly or fried egg jellyfish. 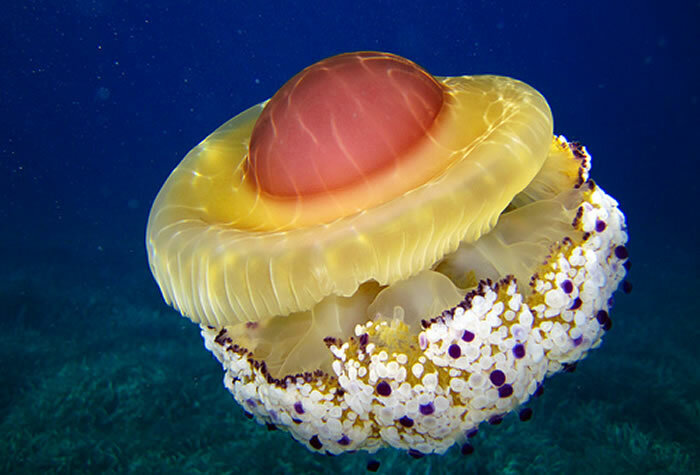 It is commonly found in the Mediterranean Sea, Aegean Sea and Adriatic Sea. C. tuberculata is usually less than 17 cm wide. The smooth, elevated dome is surrounded by a gutter-like ring. The marginal lappets are elongated and subrectangular. Each mouth-arm bifurcates near its base and branches several times. In addition to some larger appendages there are many short, club-shaped ones that bear disk-like ends. 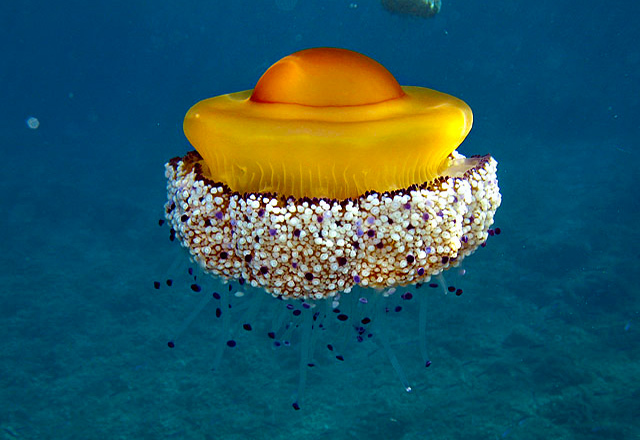 The unusual looking Mediterranean jelly, also known as the “fried egg” jelly, has a smooth, elevated bell surrounded by a ring. It has numerous short, clublike appendages that expand and flatten at the ends, in addition to some longer ones. 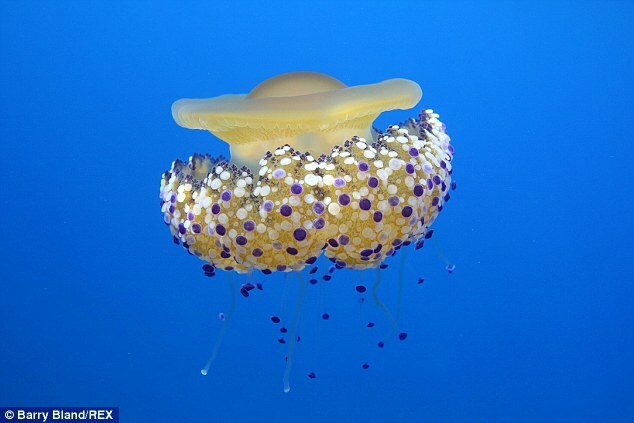 The clustered appendages contain mouth-arm openings that are colored deep purple. 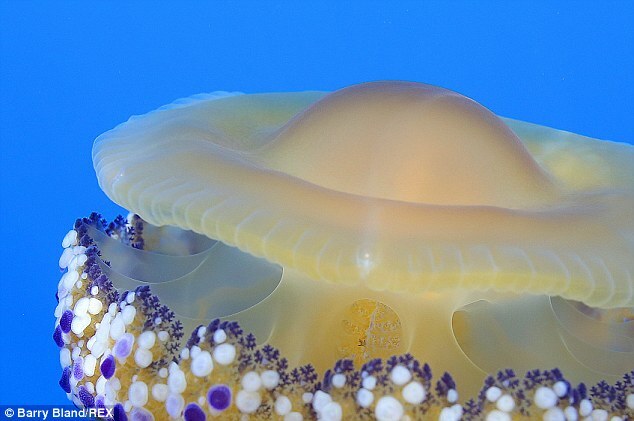 This jelly only lives for about half a year, from summer to winter. Researchers think this short life span is the result of adapting to a highly seasonal environment where the water temperature varies greatly. 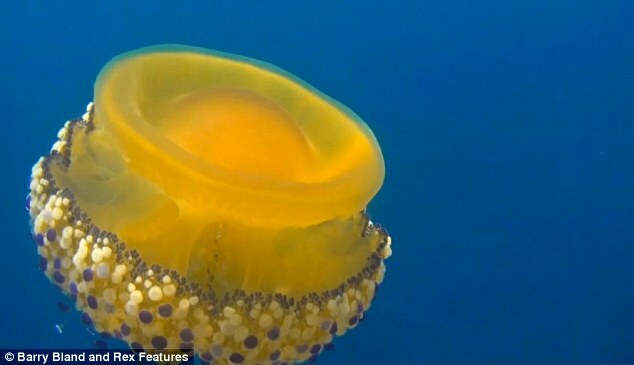 Photographer Barry Bland came across one of the free-swimming marine animal – and was thrilled to find that it looked just like a fried egg. 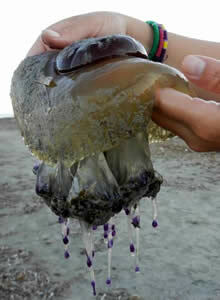 The jellyfish lives in warmer waters as it needs a lot of sunlight to survive. 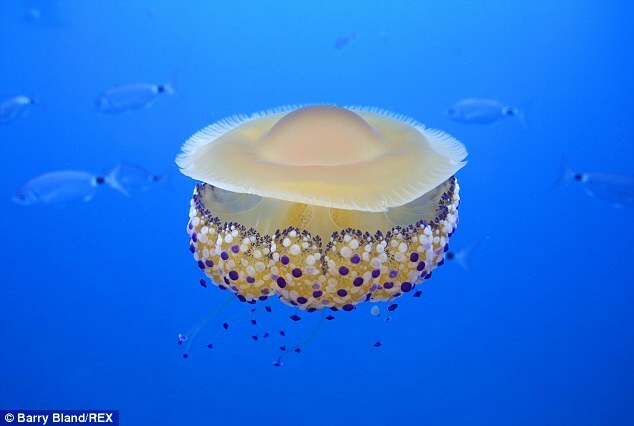 With bright blue balls of colour speckling its umbrella-shaped bell, the eye-catching sea creature alternated between resembling a decorative lamp and a welcome addition to a fry-up. 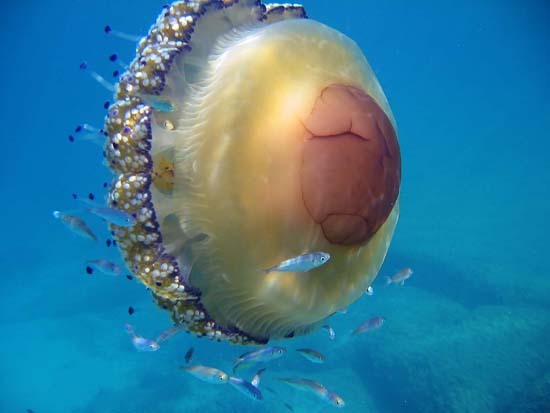 The Mediterranean Sea is one of the more common areas they’re found, as well as the Aegean and Adriatic seas, given their need for a large concentration of sunlight to survive. And while they’re stunning to look at, they’re also considerably safer to be around than their counterparts, as their sting has very little or no effect on humans.